My stomachs bigger then my wallet.. This past May I had the honor of being in my cousin John’s wedding, which was in Fabulous Las Vegas, home of In-N-Out Burger. I have known of In-N-Out Burger for years and it has been number one on my must try cheeseburger list. I live in New Jersey so I don’t have the luxury of West Coasters who have them on basically every street corner. First thing I did when I got to my hotel room was find the closest location which was within walking distance. It was finnally happening, I get to try Animal Style and weigh in on the infamous Shake Shack vs In-N-Out debate! When you first walk in it just looks like a McDonald’s mixed with a Five Guys. The line moved quick but there was no where to sit. We had to lurk around for a table becuase otherwise we would have had to eat standing up. We ended up with a table and the food didnt take long to come out at all. I got a Double-Double cheeseburger and a side of cheese fries all Animal Style. Animal Style is on their secret menu and is basically a mustard grilled patty, extra In-N-Out sauce, grilled onions and pickles. You can get it on you fries too! I was super impressed by my burger. The actual patties were not anything special, just your normal fast food grill taste. All the toppings were fresh and well balanced. I normally like a plain burger but I devoured the whole thing. (no lettuce no pickles) The best part was their sauce. It’s a gourmet Big Mac sauce and it goes well with everything. The double-double and some fries was enough too satisfy my hunger, I proably could have went for another one, but I would’ve been full. My uncle Mark was kind enough to capture my first bite below. I think my expression is a good representation of how the burger was. It was so good I had to go back a second time on my trip. My vacation in Las Vegas and knocking off the most anticipated spot on my food bucket list was unforgettable. I finally had tried all the burger big wigs. The hype for In-N-Out was real and was all true. However, in the debate on Shake Shake vs In-N-Out my heart stays on the East Coast and Shake Shacke reigns supreme! Our first stop when we got to Orlando was Universal City Walk which was walking distance from our hotel. We ate dinner at a classic spot Bubba Gump Shrimp Co. If you’re a fan of the movie this shrimp shack is decked out in movie props and all kinds of cool decor. The menu has lots of seafood and fun drinks that come in souvenir glasses you get to take home. I ordered the Steamed Crab Legs with fries $26. You get a pound of the crab legs steamed in garlic and herbs for market price. Nothing bad to say about my meal, the crab legs were perfectly cooked and the fries were fresh. Next stop was in the park. Universal Studios is home to Simpsons Land which includes Moe’s Tavern and Krusty Burger. I was real excited to try the Krusty Burger $11 a second time since the last time i had it was in 2013. But unfortanetly for me it was the worst thing i had on the trip and probably the worst burger I’ve EVER had. It’s a pretty simple burger with cheese sauce and a secret sauce that resembles Big Mac Sauce, but the bun was old and the meat was cold. The curly fries on the side tasted burnt even with cheese sauce smoothered on them. Luckliy for me i got to wash it down with a nice Duff Beer $7. Something i would reccomend to anyone who goes to Orlando has to be the Butter Beer $8 in Harry Potter World. It’s a delicous Butterscotch drink you can get cold or hot. I got the cold version which had this amazing whipped froth on top with a slushy like drink underneath. I’ve been eager to try Zinburger after I saw a Facebook post claiming Zinburger was the best burger in New Jersey. A couple months later a Zinburger was being built right by my house. And now here we are. First off it looks pretty cool inside. It feels like you are on the set of a Perdue Farms Commercial and the wait staff had weird farmer uniforms on. It’s got a nice bar, out door seating and fly covered window seats. But Zinburger’s first strike is… no bottle of ketchup on the table. That means im gonna have to ask for extra and its gonna take a while. But all that aside the menu is a la carte so no sides come with your burger. An average burger price is around 11$ and the sides 6$. You can also choose American Kobe Beef over Certified Angus Beef for an extra 5$. 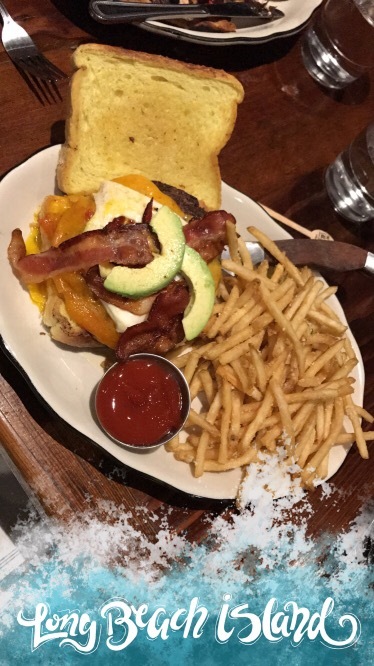 I got the Breakfast Burger which had a fried egg, applewood smoked bacon, avocado, american cheese and mayo with Kobe Beef for 16$ and a side of double truffle fries with truffle aioli, truffle oil and parmesan cheese for 6$. The bun and the cheese was the best part. The beef needed salt. the egg yolk was runny and not very good portioning of the toppings. The avocado to burger ratio was very low. But overall the burger was actually good and pretty big. The fries were good too. Fresh and defiantly hand cut. 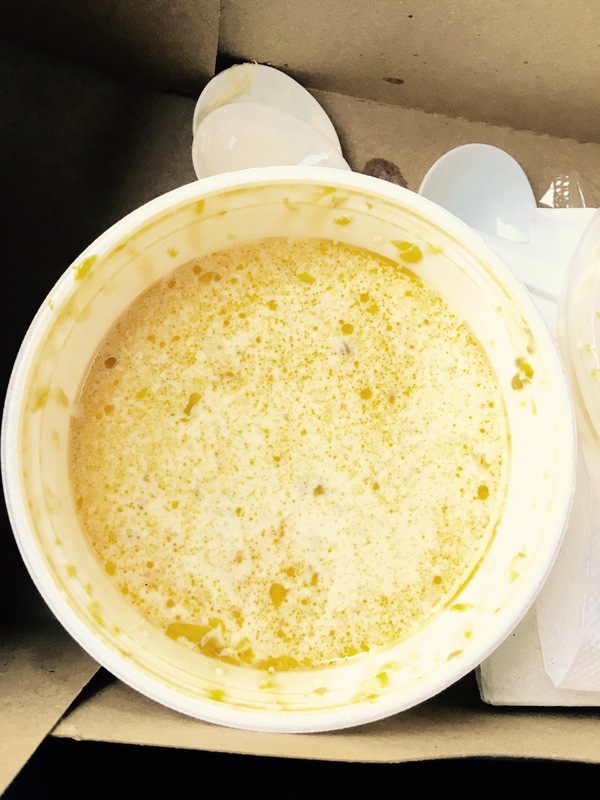 The cheese sauce was really good. The mac n’ cheese was okay, it had bread crumbs, was real creamy with white cheddar cheese and had classic macaroni. Overall if you are able to overlook the high prices and are looking for a good burger in a cool setting I’d suggest heading over to Zinburger. Breakfast burger, Cheese Fries, Double Truffle Fries. If you ever have the pleasure of going to the jersey shore you have to make time to go to The Old Causeway in Manahawkin NJ. 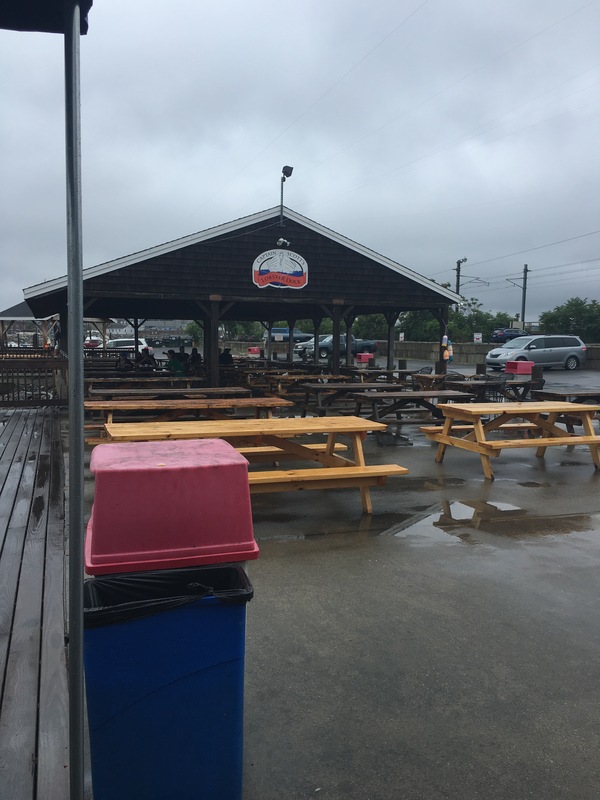 Right off 72 on your way into LBI it sits right there by itself only accompanied by its younger uglier brother Mud City Crab House. As you enter you walk right into a cool bar area with lots of tables for socializing and waiting. And you’ll enjoy that area if you go on a weekend cause there will defiantly be a wait. Once sat you’ll get taken to the dinning area which has a good industrial old time shore vibe with thick wood tables and thin metal chairs. But enough about the interior the most important part is the food. They’ve got oysters, steaks, sandwiches and lots of bar food. The main item on their two sided menu has to be their wings. 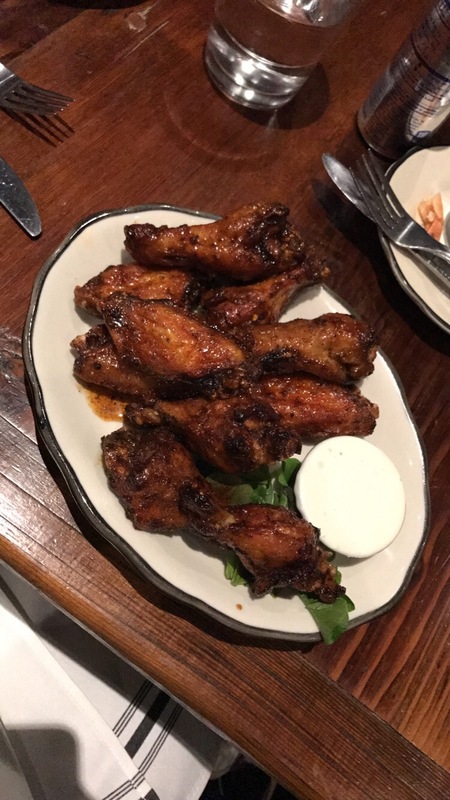 A great starting point for 10$ you get ten wings. They are the perfect mix between dry rub and sauce. Great mix between crispy and juicey. They have a good peppery carmelized taste that you can’t quite figure out but gets you hooked on your first bite. For my entree I got the steakhouse burger 14$. Medium rare burger with avacado, fried egg, bacon, cheese, chipotle ketchup all on Texas toast. Are you drooling yet? The cold avacado mixed with the warm burger just makes everything melt in our mouth. The burger didn’t have a ton of flavor but you don’t wanna over do it with everything else supporting it. The bacon was a little to smokey for my liking. But all the cheese made up for that. The one thing that really makes the meal for me has to be the side of fries. Shoestring fries with Parmesan and parsley. Any place where Parmesan fries aren’t extra and actually come with your meal are doing something right in my book. 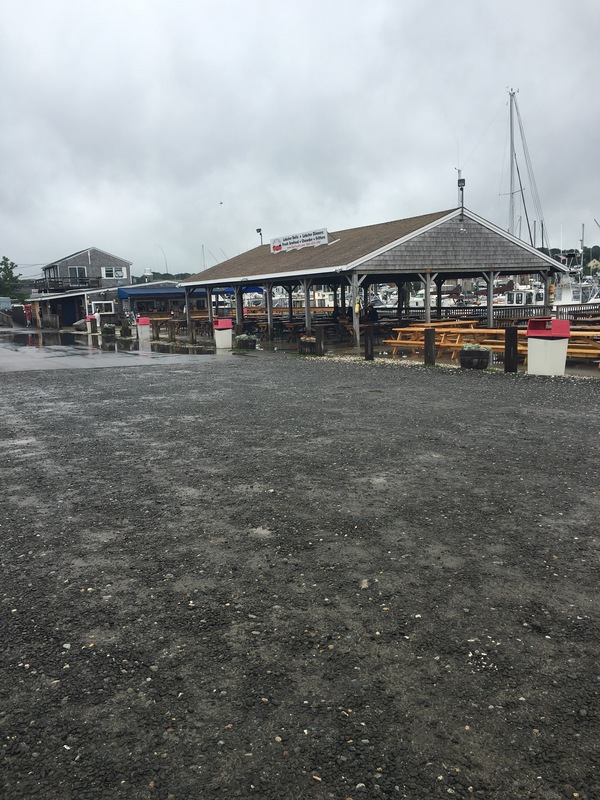 The final stop, the place I’ve been waiting to go for probably a year now, Captain Scott’s Lobster Dock! Located in New London, Connecticut down a creepy industrial rode where only the locals would know about. Right on the water facing a bunch of boat slips. Little shack with lots of picnic tables for munching. 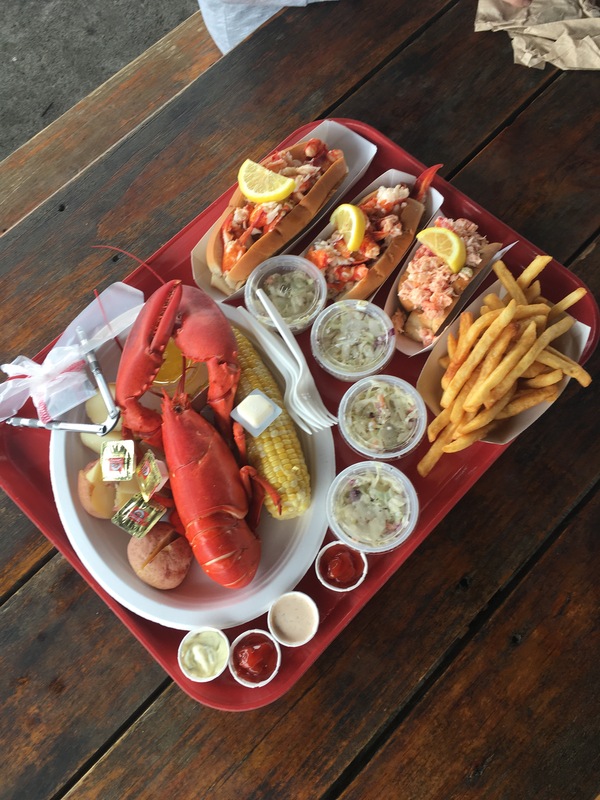 They have every type of roll, full lobsters, sides like French fries coleslaw and ice cream for desert. They have two types of lobster rolls as well. Warm and cold. The warm roll is just lobster meat and the cold is a lobster salad. There’s also two different sizes. Reg which is just on a hotdog bun and a large which is on a footlong roll. 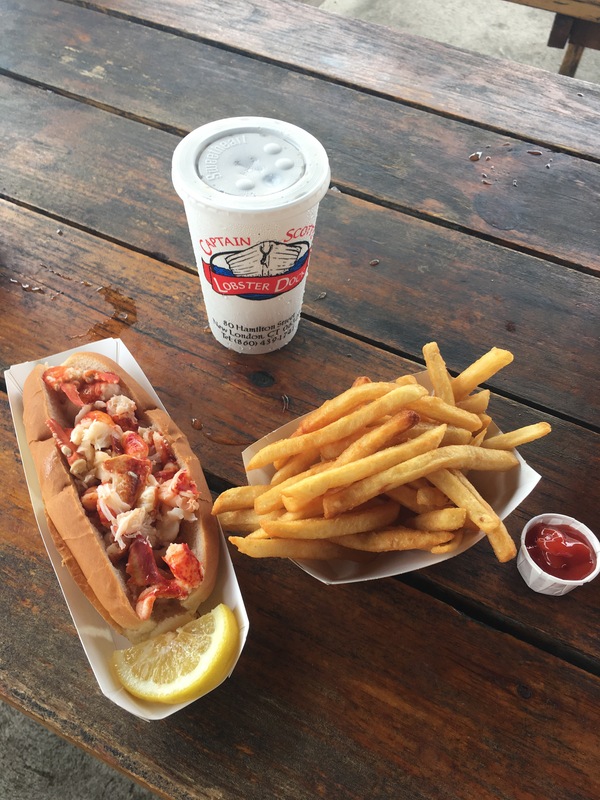 Of course I got a large warm lobster roll with a side of fries and a root beer. 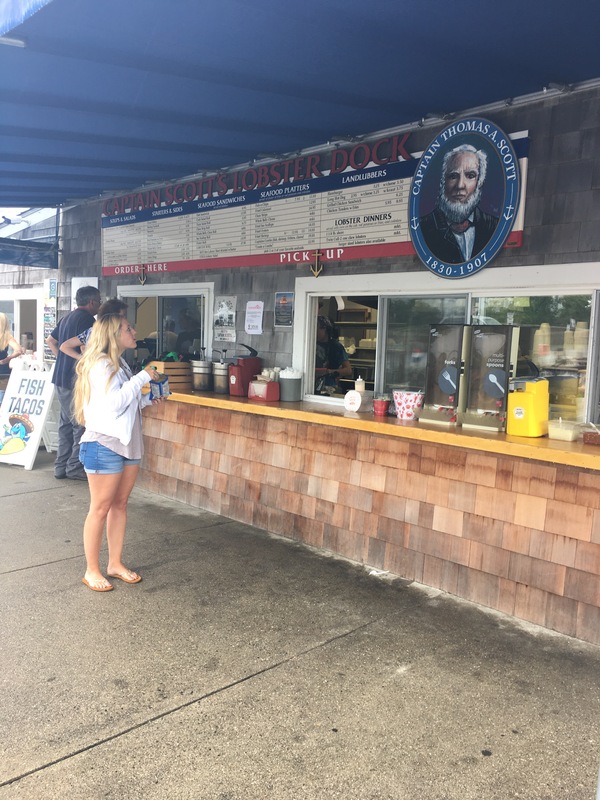 15.95 for the large lobster roll, 5.95 for the fries and like 2.50 for a fountain drink. But the anticipation did not disappoint. The lobster meat was probably the best I’ve ever had. What I liked about it was there wasn’t a lot of butter on the bun so they were going strictly of the lobsters flavor. What was a little disappointing though was the bun. It was falling apart. It was more like a slice of bread then a bun. But any of the excess lobster that fell off I just put on my fries! The scenery, the food, defiantly gonna have me wanna go back! 8/10 grub points. I’m not a big breakfast person mainly because I sleep thru it, but we stopped today at Amore Breakfast/Cafe Amore for some grub before we headed outta town. I got cream cheese stuffed French toast with a side of home fries for 7.99 which was a great price. 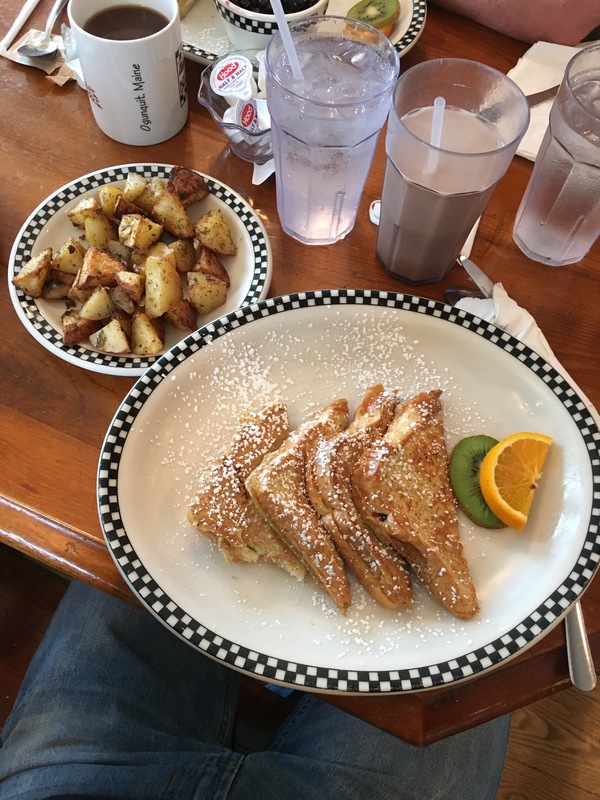 The cream cheese French toast was the perfect size. It had just the right amount of cream cheese infused in between the slices of bread and was moist enough to were I wouldn’t have had to use any syrup. The home fries were delicious as well with a nice seasoning on them and great size. The whole meal was 8/10 grub points.